A fully operational used GPR as a complete unit ready to go. 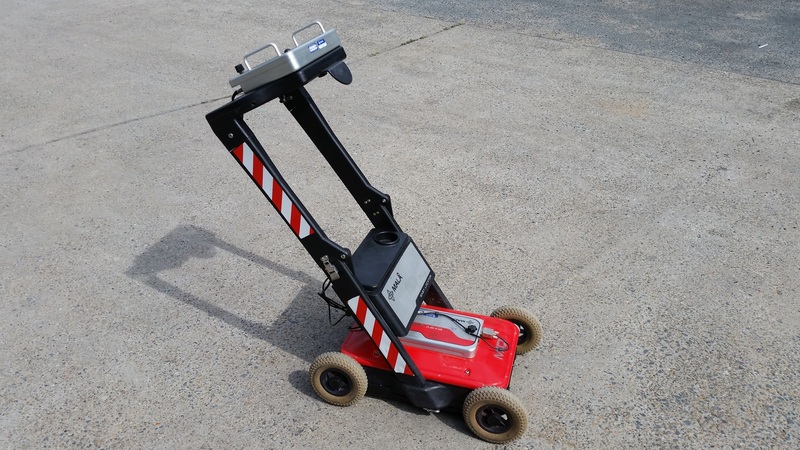 The Easy Locator from MALÃ… is an easy to use, entry level Ground Penetrating Radar (GPR) system designed to meet your utility locating needs. The Easy Locator is the tool of choice for those who need to quickly and easily identify the presence of buried utility infrastructure, both metallic and non-metallic. Modern advances in technology, particularly in the design and construction of buried utilities, have resulted in an ever increasing use of non-metallic materials. Locate professionals know the difficulties associated with non-metallic utilities and that conventional locating tools leave you a few pieces short. So let the Easy Locator help you fill in the missing pieces. GPR is the only technology available that does not require a physical connection to the utility, nor does it rely on radiating electromagnetic (EM) fields that may or may not be present or detectable. The product’s simple yet ergonomic and field rugged design, intuitive user interface and clear display is testament to its success and it remains as the number one choice in its field. • Available in nine different languages (English, French, Italian, Spanish, German, Swedish, Norwegian, Russian and Chinese). With fast start-up and minimal set-up the Easy Locator can be rapidly deployed and the user can be out collecting real-time data at full walking speed within minutes of arriving at the job site. MALÃ…’s unique single push/ turn button control allows for quick and simple operation. A clear easy to read color LCD combined with a back up cursor allows for easy interpretation of data and efficient on-site marking of utilities. An optional feature allows images of the screen data to be saved in jpeg format which can then be exported via a USB thumb drive for use in field reports. The hinged shaft design allows the Easy Locator to be folded, creating a more compact package for efficient transportation and storage. Mid: 350 MHz. Deeper penetration, high resolution.